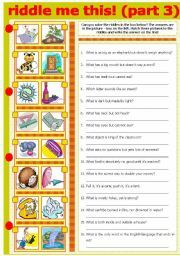 The first worksheet in a series about NOUNS. 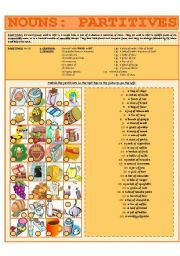 This one is about PARTITIVES related to food and drinks( a loaf of bread, a bunch of grapes, a cup of coffee, etc.). Enjoy!!! 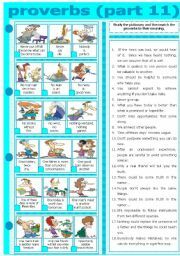 The follow-up for the grammar-guide on the verb TO BE. KEY INCLUDED! ENJOY !!! After all our work, we have to be paid, no?! 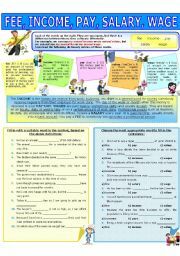 So, here is the last COLLOCATION worksheet for today, number 57 in the series: FEE, INCOME, PAY, SALARY, WAGE. ENJOY !!! One more in the RIDDLE ME THIS! series. I have quite a few more. ENJOY!!! 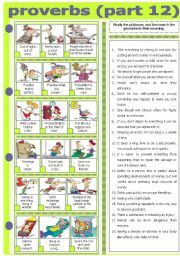 The third one today: COLLOCATION - HAPPEN, OCCUR, TAKE PLACE. ENJOY!!! 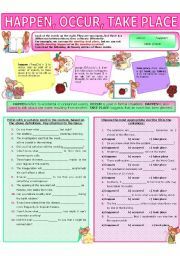 Follow-up for the worksheet on SEASONS - SPRING. 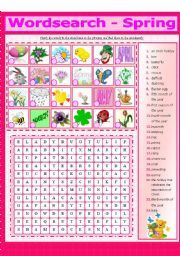 Match the words to the pictures and find them in the wordsearch. Enjoy! Part 12 in the PROVERBS series. There are only three more left and the series will be complete. ENJOY !!! Number 11 in the PROVERBS series. ENJOY !!! 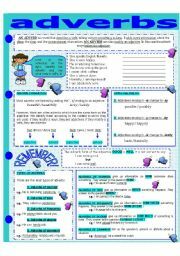 A simple worksheet containing 20 sentences to be put into the NEGATIVE FORM. ENJOY !! !